I have always loved New Orleans. My infatuation grows with age. 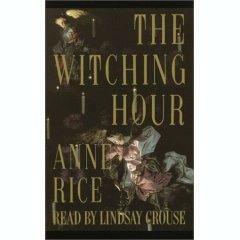 When I discovered Anne Rice's "Witching Hour' series, I fell in love. Mrs. Rice has an uncanny way with description. It was through her writing about Lantana, Bougainvillea, & Mandevilla as well as other "Southern" trees & flowers that fostered my desire of pretty things. A well written book makes me see the beauty of weaving a story about a place to make it come alive. Not a traditional travel book, Anne Rice's The Witching Hour (Lives of the Mayfair Witches) made me realize that words can create a unique sense of place that help readers see, feel, smell, be in a far-away place. My love affair with The Witching Hour actually began my freshman year of college. Cut to a few years later - I was obsessed with finding the mansion on First and Chestnut Streets in New Orleans’ Garden District. On a trip to New Orleans for New Years Eve with some friends, we found the house - 1239 First Street. Words cannot describe how incredible it was to stand there and look up at the house that inspired those books. To know that Mrs. Rice sat there and wrote those fantastic words. It is a stunning house & being able to see the property is both momentous and breathtaking. Built by James Calrow and Charles Pride in 1857, 1239 First Street is "transitional" in style, containing both Greek Revival and Italianate elements. The double galleries have Corinthian columns below and Ionic columns below, set between square pillars at the corners. Albert Hamilton Brevard, who commissioned the house, was a wealthy merchant with a taste for the finer things in life. At the time of its construction, the house contained many conveniences, such as hot and cold running water in all four of its bedrooms. However, Brevard had little time to really enjoy his mansion; he died there, only two years after he moved in. The Reverend Emory Clapp acquired the house from Brevard's daughter in 1869 and contracted with architect Charles Pride to add the hexagonal bays. They were designed to enlarge an existing room for use as the Episcopalian clergyman's library. But Rev. Clapp found more pleasure in tobacco, and his library quickly became his smoking room. As newlyweds, the Clapps wanted their residence to reflect their style and refinement, so they began their occupancy by installing massive, beveled French mirrors in the double parlors downstairs. After Rev. Clapp passed away, his wife continued to occupy the house until 1934, taking a loving interest in maintaining it. In her later years, Mrs. Clapp enclosed part of a gallery and installed an elevator on the Chestnut St. side of the house. 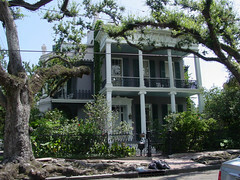 From 1989-2004, the house was the home of Stan and Anne Rice. This house is also the inspiration for Mayfair Manor, the Garden District home of Anne's Mayfair Witches. Both the side porch and the swimming pool are featured in Mayfair Family history. In Anne's Mayfair Family, the swimming pool in the backyard garden was installed by Stella Mayfair in the wild years of her youth. It is the pool that Michael Curry is found floating in on Christmas morning, 1989, after suffering a heart attack while fighting Lasher. Deirdre Mayfair sits on the side porch in silence for over thirty years, refusing to speak so as not to allow Lasher to enter her thoughts. During this time, Lasher is often seen standing beside her rocking chair, whispering into her ear. The side porch is two stories high with very ornate cast iron decorations. It fronts on two attic windows on the third story of the house. Ancient Evelyn, when she was a young girl, paid secret visits to Uncle Julien by climbing this iron balcony to the second story. Antha Mayfair climbed through one of the attic windows onto the porch roof, where she jumped to her death rather than become part of the Mayfair legacy. Behind those windows, Carlotta Mayfair poisoned private investigator Stewart Townsend, and then wrapped his body in a rug bound with chains, and stored him in the attic for fifty years to be discovered by the engaged Rowan and Michael. Michael also throws Lasher, in a Taltos body, from one of these windows to his death on the flagstones below.